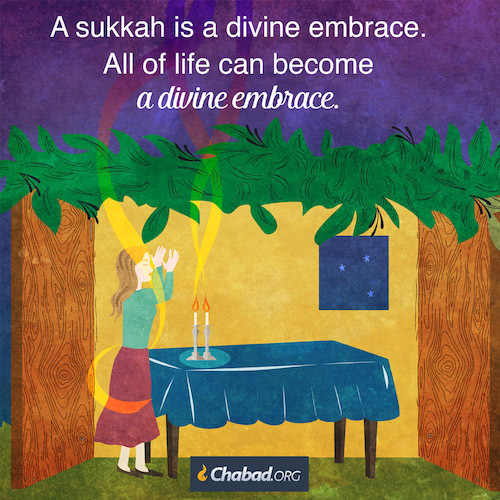 A sukkah is an embrace. You sit inside and G‑d is hugging you. All of you, from head to toe. Whatever you do inside your sukkah—sip a beer, chat with a friend, answer your e‑mail, or just sleep soundly—all is transformed into a mitzvah, a secure and timeless connection with the Infinite. And then, when you leave the sukkah to enter the world, you carry that hug with you. All of life can become an embrace. A hug with the Infinite.